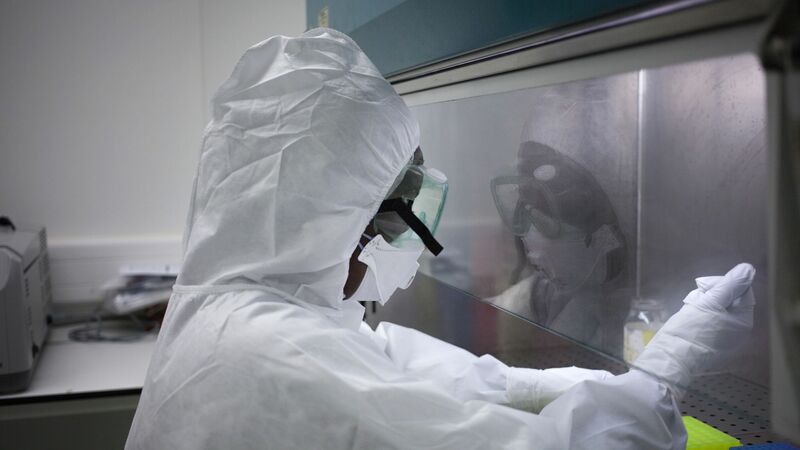 A lab technician works in the P3, the Pasteur Institute's laboratory dedicated to the Ebola virus, in Bangui on May 31, 2018. Photo: FLORENT VERGNES/AFP/Getty Images. Genetic sequencing has confirmed that the outbreak of the deadly Ebola virus in North Kivu, in the eastern part of the Democratic Republic of the Congo, is distinct from an earlier outbreak in the same country — the earlier outbreak was declared over in late July. Why it matters: Public health officials are racing to contain the new outbreak in a challenging operational environment near the borders with Rwanda and Uganda, which is home to more than a million displaced people. This region is home to many rebel groups and hosts the largest U.N. peacekeeping contingent in the world. Details: According to a tweet from Peter Salama, the World Health Organization's deputy director-general for emergency preparedness and response, health workers plan to begin vaccinating people in affected areas of North Kivu starting on Wednesday. Doctors used the experimental vaccine, known as rVSV-ZEBOV, to treat those exposed to the virus during the last outbreak in the Congo. The current outbreak's death toll has climbed. As of August 6, a total of 43 Ebola virus disease cases, including 36 deaths, have been reported, Salama tweeted. In addition, 46 suspected cases are under investigation. The WHO has warned that security issues could present a significant impediment to addressing the outbreak. "The prolonged humanitarian crisis and deterioration of the security situation is expected to hinder response to this outbreak," the WHO said. What's next: Although Salama did not specify how the vaccine would be used, during the last outbreak the agency worked with other organizations to conduct a ring vaccination program. This involves vaccinating people who have come into direct contact with individuals confirmed to have Ebola — as well as the contacts of those contacts. Each ring might include about 150 people. In addition, the WHO gave the vaccine to health care works to protect them while treating Ebola patients. The vaccine is considered experimental because the largest testing occurred in Guinea at the end of the 2015 outbreak, and was not conducted in a way that would satisfy regulatory agencies like the Food and Drug Administration.